Kudos to RockResorts for coming up with such a creative way to add value to its winter rates. 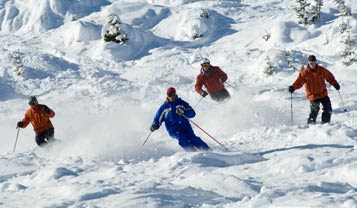 The company, which owns such ski town resorts as The Arrabelle at Vail Square and The Lodge at Vail in Vail; Hotel Jerome in Aspen; The Osprey and The Pines Lodge in Beaver Creek; Keystone Lodge & Spa in Keystone; and Snake River Lodge & Spa in Jackson Hole, now offers a "Three for Free" package. In addition to a complimentary night of lodging (with two or three booked, depending on property), you'll enjoy a free bottle of organic Bonterra wine, plus your choice of a $50 RockResorts gift card that can be used at RockResorts Spas, various restaurants, dining or gift shops OR $50 in “on-mountain cash” that can be used for dining, ski/snowboard rentals and more. The package must be booked by Feb. 28 and is valid for travel through mid-April. For more information on this fabulous freebie-filled winter package, contact The EliteTravelGal at 310.979.9036 or via email at elitetravelgal@aol.com.